Virginians are divided equally over the resignation issue of Governor Ralph Northam. Washington Post-Schar School poll finds 47 of the interviewed adults want him to step down while another 47 percent is looking for the opposite. 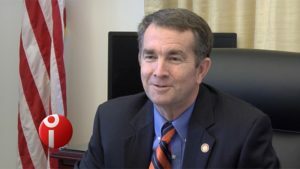 A racist photo of the governor surfaced lately from the pages of his 1984 medical school yearbook in which Northam is seen in blackface standing next to another man who was wearing a white Ku Klux Klan hood. Northam initially admitted he was in the photo but later denied being anyone in the image. However, he was condemned by several Democrats, state legislators and progressive organizations. He was called for resignation and Northam has continued resisting the demands saying he will stay in office until 2020, when his term ends. Meanwhile, Virginia Attorney General Mark Herring admitted he too wore blackface in the 1980s. The poll was conducted between February 6 and 8. Northam’s successor Lt. Gov. Justin Fairfax is swept up in a sexual assault scandal. Two women have alleged he had raped them. Democrats too are calling for the resignation of Fairfax and it is not clear whether he will step down. Northam said he is supporting the investigation of Fairfax without ruling out having to ask him to step down.